This week we learn how to pair Latin and Kanji type with Tien-Min Liao, creator of the Bilingual Lettering project. Tien-Min Liao’s project Bilingual Lettering explores how to pair Latin and Kanji type and achieve the same aesthetic and brand expression across cultures. Tien-Min explains why designers get it wrong today, the differences between the two traditions and techniques for getting it right. 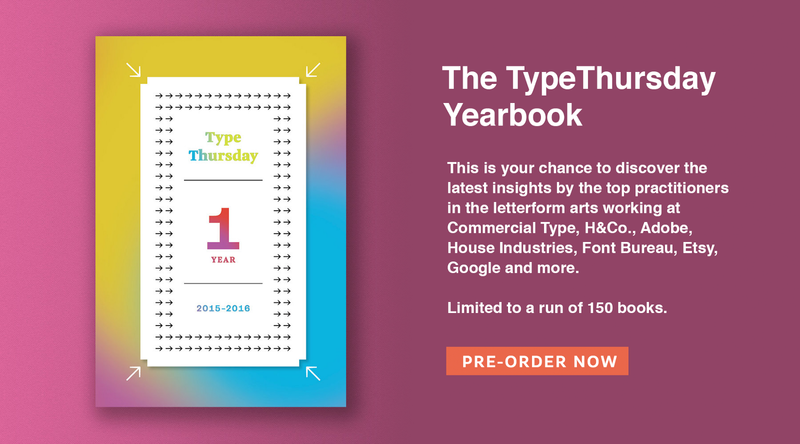 TypeThursday is the meeting place for people who love letterforms. Join us. Ulrik Hogrebe: Hi Tien-Min, thank you so much for joining us. So, you do a lot of work dealing with the pairing of Latin and Kanji lettering, and how you can translate the look and feel from one script to another. I’ll dive in to that in a moment, but before we do that, maybe you’d like to tell our readers a bit about yourself and where your interest in type stems from? OK, I am originally from Taipei, Taiwan. I came to New York to study graphic design after graduating from college in Taipei and now I am working in a branding agency called Siegel+Gale where I have had the chance to work on a lot logotype development and refinement projects, which is part of where I am coming from with my bilingual type studies. I got in to typeface design while taking one of Jesse Ragan’s typeface design workshops at Pratt. 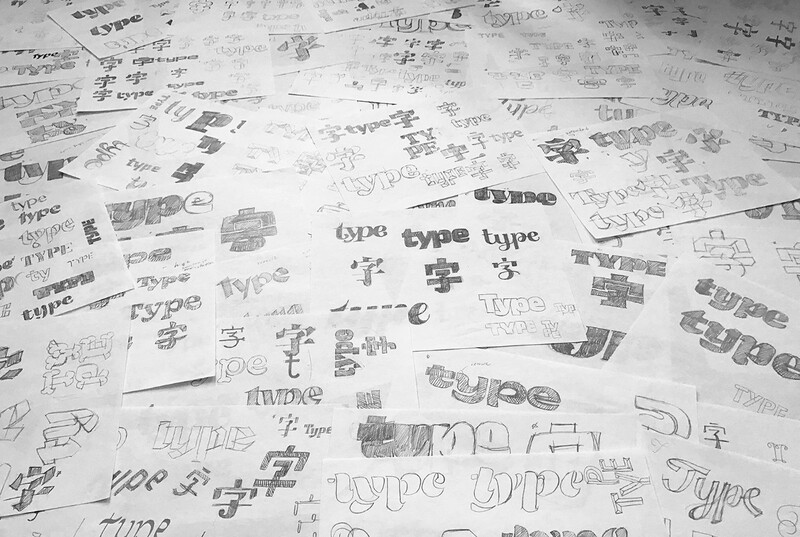 And then a year later I got in to the Type@Cooper program, while still working at S+G. After working in a branding agency for a while, and traveling between US, Taiwan and China, I started to notice that a lot of western brands didn’t make their Chinese/Kanji version logotypes as good as their original logotype and vice versa. Ulrik: So what was it that drew you to type design? Tien-Min: I remember when I was in middle school, I was fascinated by the custom logotypes for these Taiwanese pop artist’s album designs. That was the first time I noticed how much personality type can bring into a design. But before I took those typeface design classes with Jesse, I didn’t know much about the difference between things like typeface design and lettering. Ulrik: Cool, and what was the experience like at Cooper? Especially working on the side? Was it a tough period, or was it nice to have job on the side where you could apply your learning? Tien-Min: I was very busy at the time, working during the day and taking classes at night and on the weekend. The workload was pretty heavy, but I enjoyed it a lot! After I graduated from the program the first time, I went back to take the program again (most of the classes that is. I did miss a few…) but this time with different instructors. I felt like one year was not enough — and it was really fun to take it with a new set of instructors. Really, for me the first year was just the beginning —and after I finished the second year I felt more comfortable in terms of making my own design decisions when working with type — and at the same time I started to have more opportunity to work on some logotype refinements at S+G which also grew my confidence. Ulrik: Wow! You took the course twice! That’s dedication. Right, so let’s talk a bit about your work in bilingual lettering. Can you explain the project to our readers? Tien-Min: Well the project is a series of Latin-Kanji pairing studies for use in bilingual lettering and logotypes. I’ve also written some essays on my observations, process and synthesis, and documented all of it on my site. Ulrik: Right, and I stumbled across it on your Instagram which I have been following for a while now and really find the work interesting. So tell me, what is the problem you are trying to solve with the project? 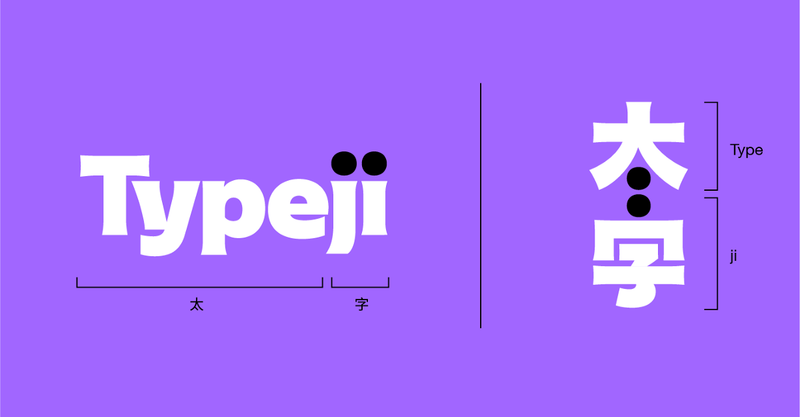 The logo for the Typeji project; the two logos share the same personality, elements and meaning. Tien-Min: Wow, thank you! After working in a branding agency for a while, and traveling between US, Taiwan and China, I started to notice that a lot of western brands didn’t make their Chinese/Kanji version logotypes as good as their original logotype and vice versa. What people usually do is they choose an existing typeface (mostly a generic one) to pair with their original logo. So a Latin logotype gets a generic Kanji script and vice versa. However, this kind of treatment works only when both languages appear at the same time, When the translated logo stands by itself, the brand personality is typically not present at all because all you are seeing is the generic. It’s not designed to be a logotype. The other common thing that I often see is that even when someone has gone through the effort to draw a translated logotype, it is often badly drawn by designers who are not familiar with typeface design. For example, I often see wrong thick-and-thin strokes in Latin or Kanji logotypes respectively. So I was wondering if there is way to make both languages or scripts work together and be able to express a common personality at the same time. And that is really why I started this project. Ulrik: That’s really interesting. I hadn’t really thought of that being mainly familiar with Latin script — but it makes sense. And of course, I am aware that companies like Toyota or VW are investing in families of typefaces across Latin, cyrillic and Kanji, so what you are saying explains a lot about the motivations for those companies to want a consistent brand across cultures. So tell me a little about the differences in designing Latin script and Kanji? Tien-Min: Yes, some big corporates have the budget to invest in multi-language typefaces for use in throughout in their brand’s visual identity. But for most of the clients, although it might be hard for them to do custom typeface, I think at least they should be trying to customise their logotype. When it comes to Kanji and Latin, the two scripts are really different in terms of structure and the density. As a script they can both can be divided into smaller units, but the way those units are put together is totally different. Latin script is arranged horizontally while every Kanji characters is built differently. Some are built with two units—one on top of the other—some are set side by side, while some are built with multiple units, so the density between each character varies. Compared to Kanji, Latin script looks relatively even. Ulrik: Right, and am I correct in thinking there is a somewhat limited amount of Kanji typefaces to choose from as well — I think someone was telling me that because of the huge character sets, it’s relatively expensive to design a Kanji typeface? Tien-Min: That’s true. 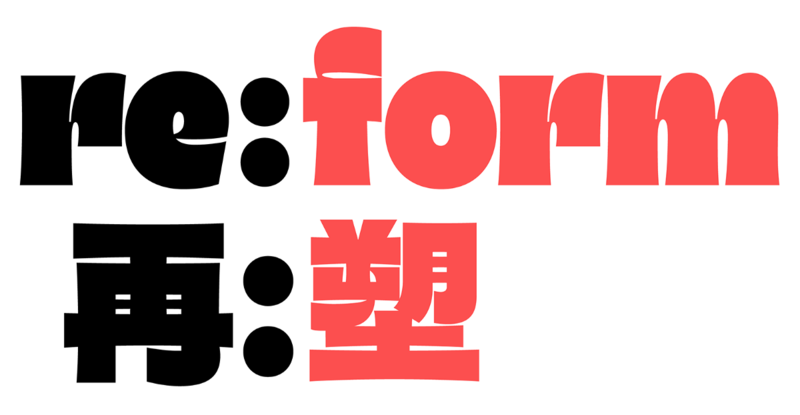 There are not as many typefaces in Chinese or Japanese compared to Latin typefaces, but because of this fact, I think this should spur people on even more to do custom logotypes in Kanji. Ulrik: Tell me a little bit about your process? How do you go about creating your pairings? Tien-Min: I usually start with one script and sketch it on paper first. 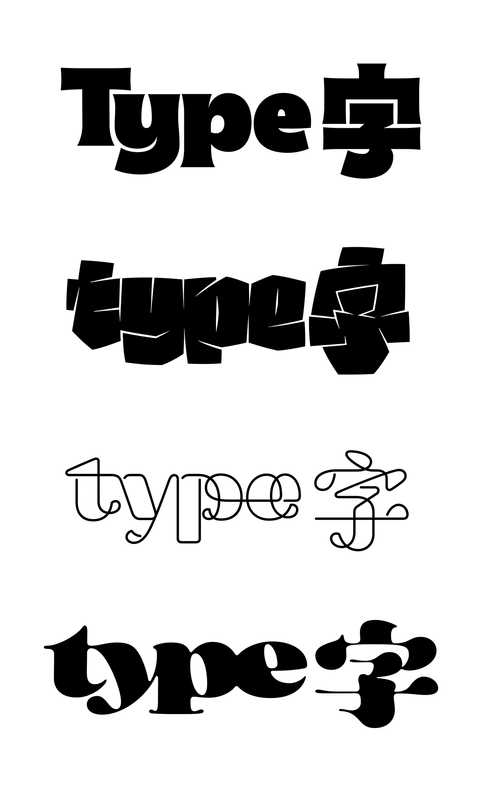 At first, there was a lot of failure trying too hard to force logotypes to have the same appearance. But it’s hard—traditionally Latin and Kanji are drawn with different tools so there are differing weight distribution rules that need to be followed. However after doing around 50 exercises, I started to figure out a systematic way to do it. Left; Using the typeface’s features as decorative elements. Right; imagining that both are drawn with the same tool. I use three methods to create complimentary styles. The first one is to create the structure based on traditional weight distribution and then extracting the traits from the other script as decorative element. The second one is to imagine they are drawn with the same tools. However, this kind of treatment often makes the type look informal or a bit too stylised. The last one is totally illustrative. Treating both as images and creating a more expressive lettering or logotype. Which one is the better approach really depends on the design subject. After deciding which approach to use, the next step is to make sure they are consistent in all visual parameters, such as color, tension, balance, contrast and so on. For instance, Li-shu is one kind of calligraphy style; it was often found carved on stone from the Han Dynasty, so it is usually used to express seriousness, but it may also make things feel a bit old. Ulrik: That’s a great approach. I think I’ve also read you saying that it’s not just making the Latin script and Kanji look the same, but also having them express the same thing across cultures? So if a logotype is meant to look modern and forceful in Latin, then the Kanji should echo that too? Is that always easy to do? Tien-Min: Yes. I think they should express the same personality. I feel one must have cultural knowledge of both scripts to do bilingual lettering well and to really understand the cultural cues. For instance, Li-shu is one kind of calligraphy style; it was often found carved on stone from the Han Dynasty, so it is usually used to express seriousness, but it may also make things feel a bit old. Ulrik: That’s fascinating — is it a stupid question to ask how many calligraphic styles there are? And how are they used? Do people change between them depending on what they are writing or… Is it like as a westerner I might choose a more severe serif if it needs to look serious, a lighter sans if it needs to look more modern? Tien-Min: There are five big categories in terms of calligraphy. It’s hard to say which one is more modern. Sometimes it also depends on how they are drawn. It’s like blackletter can be used in both old and modern ways. Apart from calligraphy, there are also many different typeface catalogues like Song-ti, Hei-ti and and so on, just like Latin typefaces. Ulrik: Got it. Ok, so if I am a type or graphic designer and want to learn more, how do I do it? Where do I start? Ulrik: Ha, yes — I was reading through some of that earlier on. It’s a nice primer though. However, sounds like there is a gap in the market for a book or instructional series — a project for you perhaps? Tien-Min: Haha, maybe I can translate some really good books into English in the future if people are interested. Ulrik: That sounds like a great idea! In the meantime, thank you so much for your time. I’ll look out for the book and in the meantime, I’ll follow along on your website and Instagram. Best of luck in the future! 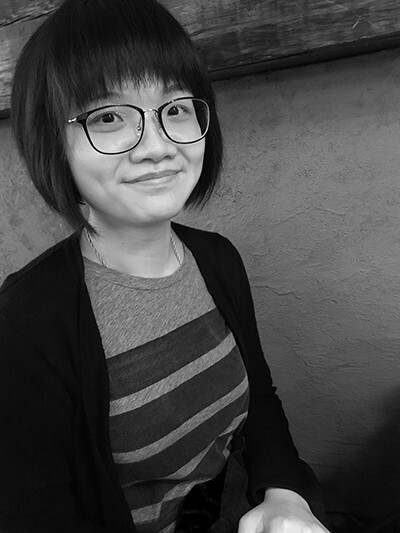 Tien-Min: Thank you so much for your time chatting with me! Want to see more of Tien-Min’s work? Her portfolio is a treasure trove of type goodies: typeji.com. Love these interviews? 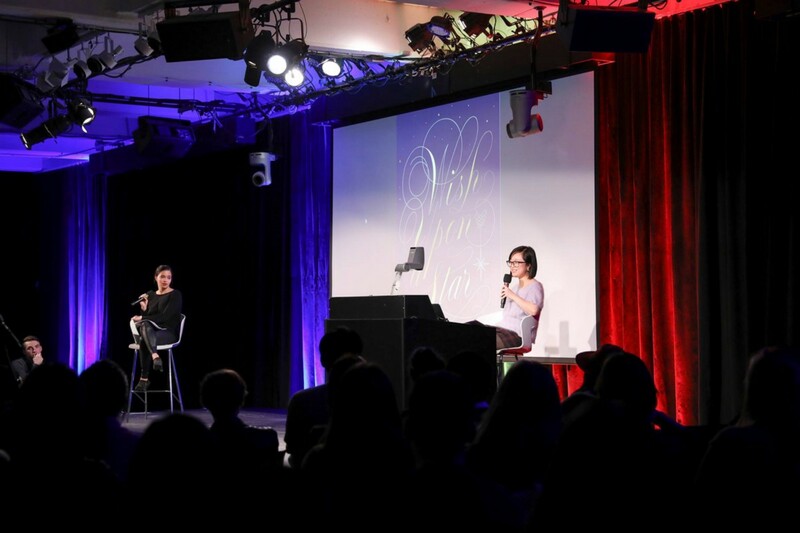 Sign up to the TypeThursday mailing list to be the first to know about our next interview. Was this article interesting to you? Give us a clap! It helps share the conversation you loved. Designs stuff at WeWork, CIID alumni, former CD @ frog design and CD at BBC News and The World Service. Also designs type, slowly. A meeting place for people who love letterforms.